Centerprise is pushing deeper into the distribution space with a new dedicated brand and sales office in Telford. The advent of 'Ci Distribution' will see Centerprise move beyond distributing just rugged devices and into the components and peripherals space.A new office in Telford dedicated to the brand has been established. Jon Atherton, who joined Centerprise Group as commercial director in March, said the investment marks a big departure for the firm. "Centerprise as a business has been trading for 33 years, predominantly, as everyone knows, focused on MoD and defence – obviously that has expanded over the years to different verticals, it has had a distribution team for in excess of 14 years but purely focused on rugged devices and peripherals, and they've been very successful selling those to the channel. But it was never separate as a business in terms of the branding. 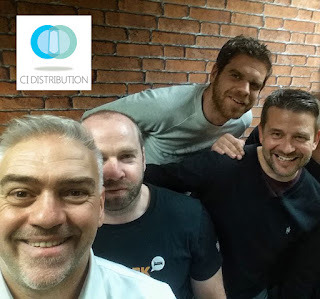 Since I've come on board I felt it was important to split that off, hence why Ci Distribution was born." "It now has its own logo and focus within marketing and within the business." New hires in Telford include (pictured from left to right) Steven Parker, Iain Gillogaley, Ben Davies and Darren Perks, the latter of whom worked with Atherton at Entatech. Adding in the rugged device and peripherals team that works at Centerprise's Basingstoke HQ, Ci Distribution has a headcount of 12, up from five when Atherton joined. "We've got four people [in the Telford office] who have over 100 years' experience in IT distribution, who obviously know a lot of people at customers and suppliers," said Atherton. "Our prime focus will be around components and peripherals and some unique products into the market. We are optimistic it will be a success." Atherton added.